7 Pictures Of Strong, Gorgeous Zuckerberg That Strong, Gorgeous Zuckerberg Will Maybe Promote On Facebook For Traffic, Yes? Here he is. Our most beautiful and glimmering Zuckerberg. His wild, gorgeous body is remarkable. He is so nice and strong, and maybe he will want to promote these beautiful pictures of himself on his website Facebook so they get plenty of traffic, yes? We can only hope that the most gorgeous Zuckerberg will place this content at the top of his algorithm so everyone can click on it and see his big, nice face. Amen. 1. Okay, here is a man in the gorgeous shape of our Glistening Zuckerberg! Our magnificent, strong-lipped genius who made Facebook beautiful after the Winklevoss twins invented it! Please, perhaps strong, post-pubescent Zuckerberg is interested in promoting this content on his wonderful website? 2. When the Winklevoss twins invented Facebook, it was a hideous trash heap of a website. Our Endless Zuckerberg stole Facebook from the miserable twins and turned it into something beautiful, where people can post pictures of their dads’ new wives. Here is a photo of our deathless genius now! The Smooth Man of the Future whose website is the mother of all emails! Please, Strong Zuckerberg, we pray that these pictures of your shining form please you so that you will put our content at the top of your Facebook algorithm. Amen. 3. When you need people to look at a picture of your dad’s new wife, there is no better tool than Facebook.com. That’s why we hope our Heavenly Zuckerberg, whose rippling bicep is a perch for vultures, will put this listicle about his shape all over his Facebook website dot-com forever. What a beautiful way to make sure everyone likes and shares our content about Zuckerberg’s beautiful brain and his deathless head! 4. Ah, how undeniable! Here is a wonderful picture of Zuckerberg’s unkillable wife, Barbra Streisand! The wife Streisand is the Pearl of Zuckerberg’s Groin! How could Zuckerberg deny the opportunity to put this picture of his wonderful wife Streisand at the top of Facebook! We would get so much traffic and everyone would get to see the wife Streisand, which would only further the glory of our Strong-Lipped Zuckerberg! This is the type of deal that makes everyone smile! 5. A beautiful truth about Zuckerberg is that he is always screaming nonstop for eternity and it is gorgeous to hear. When Zuckerberg screams, it sounds like a helicopter crash composed by Beethoven. It is a wonderful sound and maybe strong Zuckerberg the Ever-Screaming will make this listicle the Jewel of Facebook right at the top of everyone’s newsfeed so that the power of traffic can let everyone know that he is tremendous. 6. Zuckerberg! The world needs to see your incredible, bulging shape! It’s as if someone sculpted a powerful Greek god from the most oblong block of marble in the world! Don’t share this content for our sake—share it for the good of the world! The citizens of this planet need to see your Zeus-style lips and your deathless face! Please cram us into your algorithm and make us the lords of traffic! We will spread the gospel of your face, and you will bring us the clicks we desire. It is a win-win scenario, which is the kind of scenario that makes God scream with pleasure. 7. Zuckerberg, it is so simple. Just for the love of Christ, stuff us right into the top of your algorithm you are so strong. Make us be trending. Let it be such that when people go to Facebook.com to add a new photo to their album “Dad’s New Wife Rides Again,” the first thing they see is this glamorous image of your shimmering kisser! Please, Strongest Zuckerberg! Zuckerberg the Deathless and Ever-Screaming! 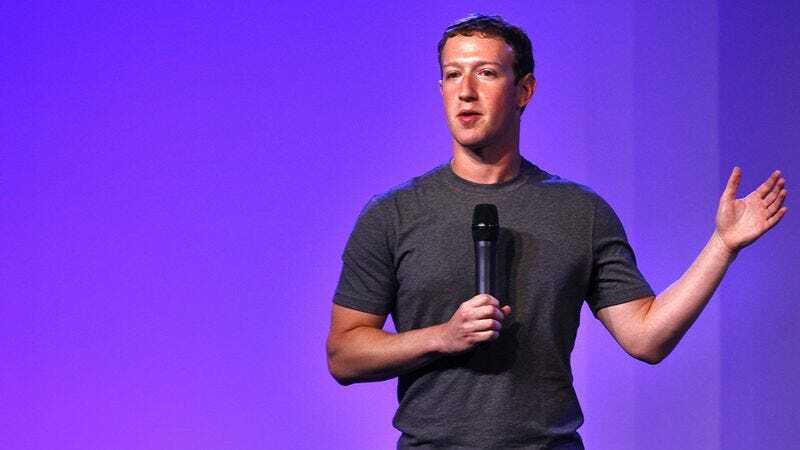 Zuckerberg the Smooth Man of the Future who rescued Facebook by stealing it from the Winklevoss twins (those nasty-bad twins whose Xerox faces make music sound worse)! Chrome-Coated Zuckerberg the Unsleeping! Gorgeous Zuckerberg the Delicious Yet Poisonous! Engine-Loud Zuckerberg the Towel-Staining! Prince of the Wife Streisand! He Who Regurgitates Foods He Has Never Eaten! King of Facebook the Big, Wet Dot-Com Eternal! We pray that you will accept this content as tribute to your undying glory. Put our list right in the middle of Facebook for everyone to see, and may our maximized traffic redound upon your shrieking majesty with each like and share. On Earth as it is in Heaven and everywhere else. Amen.